Pearl Jam’s lead singer and rock icon, Eddie Vedder, was quick to state his disappointment over Romney’s 47 percent comments. Thursday night, at the home of Don Miggs and Lisa deBartolo (daughter of former owner of the San Fracisco 49ers, Eddie DeBartolo Jr), Vedder performed for the president and a room of guests in Florida and helped net $1.7 million. There were 85 guests who paid $20,000 each. Was Eddie Vedder Aware Of The Following? While Eddie Vedder is to be admired for his success and hard-work, we were wondering if he was aware of the following. 1) We now spend every red penny of taxes paying for interest on our $16 trillion debt and for entitlements and welfare. Incredible, all money needed to operate the federal government is borrowed: that includes defense (only 19% of the budget), education, etc. 2) There are not enough rich people to pay the bill; they would have to pay a tax rate of 142%, just to cover ONE YEAR of the DEFICIT.? 3) You can now make as much sitting around doing nothing than working at a $60,000 job. 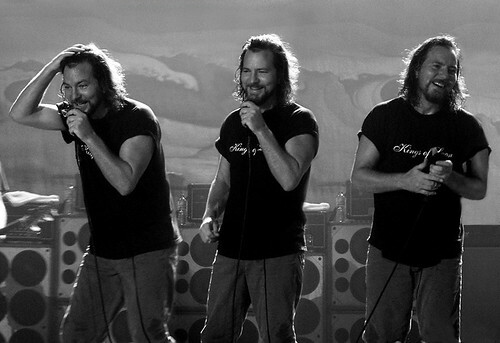 4) Mr. Vedder raised enough money to pay the government’s bills for 15 seconds.